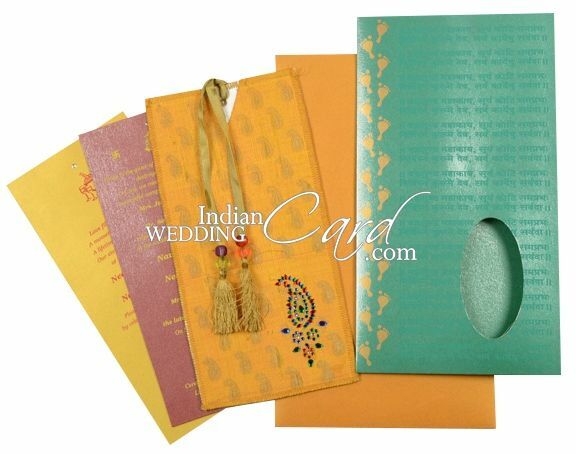 D-4618, Green Color, Shimmery Finish Paper, Hindu Cards, Card with Rhinestones, Exclusive Invitations. 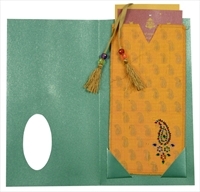 The beauty is the hand stitched inside silk pouch which has a jewelry design studded with rhinestones that can be seen thru the front oval cutout. A pull out concept for the inserts gives this card an aesthetic look. 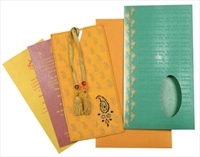 Sea green color shimmery paper (250gsm) for card. 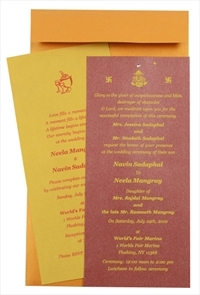 Mailing envelope and one insert in orange color shimmery paper. (250gsm) 2nd insert on red shimmery paper. 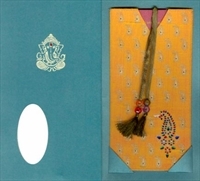 Hand-stitched orange silk pouch paste-up on inside to hold the inserts. Handmade beaded tassel to pull out the inserts. Silk Screen printing in colors matching to card.